There’s an odd, decades-old tradition concerning Christianity in film. Dumb it down for cheap laughs (Bruce Almighty), use it to win at sports (Angels in the Outfield), or trivialize it with formulaic action (End of Days), and it barely causes a fuss. Try to raise a serious question about the nature of faith, and that’s when people get upset. Try to do that and make people laugh—as Kevin Smith did with his wickedly funny Dogma—and it’s practically a mortal sin. Released in 1999, Dogma followed the classic pattern of other, more overtly serious religious movies (as The Last Temptation of Christ had, and The Passion of the Christ would—cross-reference below) by raising a storm of controversy even before reaching theatres. While some were blasting writer/director Smith’s film (and oeuvre) for being nothing more than mindless juvenile hijinks (and to be fair, there is a poop monster), others were damning it for its audacity to make fun of the Catholic Church and turn Christian theology on its head. Depending on who you believed, there was either no content at all or too much of the wrong kind. Mostly lost from the public eye in all this ruckus was a very engaging, inspired film. Dogma definitely has content; lots of it. It’s crammed with information on the Catholic faith. Among other things, viewers learn about plenary indulgence (a kind of “Get Out of Jail Free” card for sin) and “fallen” angels. There’s more pointed, detailed discussion of religion than in a month of rambling sermons; and it’s driven by true debate, not mere ranting. With the lone exception of God, who doesn’t speak, nobody is presented as an authoritative, all-knowing voice. All of Smith’s characters possess a distinct viewpoint and philosophy. They have valid points to make, but also carry personal agendas that cloud their arguments. Rufus (Chris Rock), the thirteenth apostle, wants to clear up the untold years of Christ’s life, but is also preoccupied with getting his name in the Bible. Unrecognized artist Serendipity (Salma Hayek) bemoans how the word of God had to pass through patriarchal hands to reach pen and paper. These extra dimensions serve to make the characters truly interesting and likeable, while Smith’s ability to deftly juggle these conflicting elements—along with generous doses of profane, irreverent, very witty humour—keeps the considerable amount of dialogue fresh, dynamic and a treat to hear. Just reading the screenplay would be worthwhile entertainment on its own. But the reason that Dogma works so well as a film, and not just a brilliant script caught on tape, is its evocation of an atmosphere where the commonplace and divine exist hand-in-hand. Juxtapositions of the mundane and the grandiose permeate every aspect. Though Robert Holtzman’s sets are generally ordinary and Robert Yeoman’s camerawork is unassuming, the angel’s wings are some of the most impressive ever committed to celluloid. (Their otherworldly status simply indicated by way of matching hoodies.) As we watch the non-combatants’ comedic reactions, an epic fight occurs off-screen. Rufus descends from heaven only to wind up lying bare-assed in the middle of the road. Behind everything, Howard Shore’s score mirrors the omnipresent duality by ranging from ethereal soundscapes to earthy trumpet fanfares that verge dangerously close to cheese. Smith has said more than once, “My style is that I have no style.” Wedded to this subject matter, however, his “no-frills” style becomes the perfect artistic choice: it reinforces the idea that even the most profound religious events can happen to regular people, imparting a satisfying unity of purpose to the work. Dogma boasts the best ensemble cast of all of Smith’s films. At its centre is Linda Fiorentino, who manages to maintain her sincerity and credibility through all the craziness going on around her—no easy feat. The familiar team of Ben Affleck and Matt Damon (fresh from winning a screenwriting Oscar together for Good Will Hunting) are at the top of their game. There’s a wonderful scene where “the funny one” becomes “the dangerous one” and vice versa—while together, they make a seamless transition from comic-relief buddies to the villains of the piece. It’s the crowning dramatic moment, and a delight to watch. Alan Rickman as Metatron is simply brilliant in all of his scenes, while Rock handles some important, serious moments surprisingly well. This is not to say that Dogma is flawless. Most notably, there is the aforementioned poop monster, although even it comes accompanied with Biblical justification. Serendipity explains, with some verbal diarrhea of her own, how Noman the Golgathan (its official name, voiceover by Ethan Suplee) was created from involuntary excretions of the crucified. From all of Dogma’s diverse elements, the Golgathan comes across as the one purely unnecessary component—quite apart from being disgusting, there’s nothing witty or satirical about this particular creation. It’s just poop, and the lack of any deeper level makes it seem out of place. By contrast, a fast-food-joint children’s play area shaped like a meat grinder—which could have been used to hilarious effect—is barely seen at all. That deserved more attention than the big moving bowel movement. Still, the film’s heart is what it says about religion. Dogma’s emphasis on debate, rather than absolute answers, is at the core of Smith’s approach to faith. For Smith, faith and belief are two quite separate concepts. Rufus doesn’t care for belief: “Better to have a good idea. You can change an idea.” Beliefs, argues Smith, only serve to divide people, prohibiting communication with the false premise that everything is already known. Faith occurs in the acceptance that not everything can be known and nothing is known for certain; therefore, a willingness to listen, and reconsider, is of pivotal importance. Faith can take a joke; belief can’t. Bethany asks Rufus what Christ was like. Rufus answers “He liked to hear people talk.” It makes sense that a writer/director would envision Christ as someone who just really wanted to hear what people had to say. But Smith doesn’t want the debate to end with him, so takes several shots at people who think renting the video is just as good exam preparation as reading the novel. “God, you people. If there’s not a movie about it, it’s not worth knowing, is it?” complains Metatron regarding the state of mankind’s awareness of religious issues. Serendipity puts it more succinctly: “Read the book again sometime.” Drawing conclusions about Christianity without really studying it would be as wrong to Smith as judging his film without having watched a single frame. Dogma’s goal is to make you laugh, but it also makes you think. It succeeds admirably on both counts. 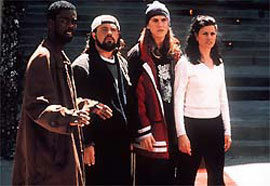 Its spirit of intellectual freedom, universal acceptance (after all, even Jay (Jason Mewes) gets a kiss from God) and unaffected warmth sends the message that we don’t necessarily have to agree on the big questions—or anything else—in order to get along, or to fulfill our higher purpose.